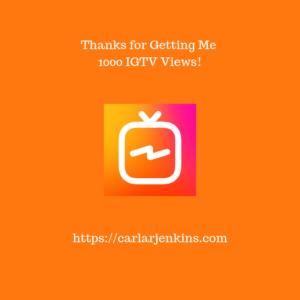 I would like to thank everybody for getting me over 1000 IGTV video views in such a short time! My community support has helped me rank #1 in several IGTV hashtags. This is a tribute to all of you for watching my videos, sharing them out and leaving positive comments. I started my IGTV channel to focus solely creating high-quality social media, personal branding and project management videos that would get the viewer to his next level. By receiving over 1000 video views, I am happy that you like them.